More pest species are becoming resistant to the most popular type of genetically-modified, insect-repellent crops, but not in areas where farmers follow expert advice, a study said on Monday. The paper delves into a key aspect of so-called Bt corn and cotton — plants that carry a gene to make them exude a bacterium called Bacillus thuringiensis, which is toxic to insects. Publishing in the journal Nature Biotechnology, US and French researchers analysed the findings of 77 studies from eight countries on five continents that reported on data from field monitors. Of 13 major pest species examined, five were resistant by 2011, compared with only one in 2005, they found. The benchmark was resistance among more than 50 percent of insects in a location. Of the five species, three were cotton pests and two were corn pests. Three of the five cases of resistance were in the United States, which accounts for roughly half of Bt crop plantings, while the others were in South Africa and India. The authors said they picked up a case of early resistance, with less than 50 percent of insects, in yet another US cotton pest. And there were “early warning” signs (one percent resistance or less) from four other cotton or corn pests in China, the United States and the Philippines. The scientists found big differences in the speed at which Bt resistance developed. In one case, it took just two years for the first signs to emerge; in others, the Bt crops remained as effective in 2011 as they were 15 years earlier. What made the difference was whether farmers set aside sufficient “refuges” of land for non-BT crops, said the study’s authors. The idea behind such refuges comes from evolutionary biology. The genes that confer resistance are recessive, meaning that insects can survive on Bt plants only if they have two copies of a resistance gene — one from each parent. Planting refuges near Bt crops reduces the chances of two resistant insects mating and conferring the double gene to their offspring. “Computer models showed that refuges should be good for delaying resistance,” study co-author Yves Carriere, an entomologist at the University of Arizona at Tucson, said in a press release. Bt crops in the southwestern United States, where growers work closely with scientists to devise a refuge strategy, do not have a resistance problem. In India, though, local pink bollworms became resistance within six years, simply because farmers did not follow the guidelines or get this support. The researchers cautioned that resistance to Bt crops was simply a matter of time, as all pests eventually adapt to the threat they face. But refuges were the key to braking it. 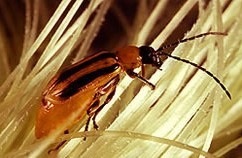 “Either take more stringent measures to delay resistance such as requiring larger refuges or this pest will probably evolve resistance quickly,” said Tabashnik. Farming groups have been furiously debating the value of refuges, and in recent years the US Environmental Protection Agency (EPA) relaxed its refuge-planting requirements. More than a billion acres (420 million hectares) of land have been planted with Bt crops since the mid-1990s. In 2011 alone, 66 million hectares (164 million acres) of land was planted with Bt crops. That year Bt corn accounted for 67 percent of corn planted in the United States and Bt cotton for between 79-95 percent of cotton planted in the US, Australia, China, and India. Transgenic crops are opposed in Europe and other parts of the world where green activists say they are a potential threat to human health and the environment. Listed below are links to blogs that reference this entry: 5 major crop pests develop resistance to genetically engineered seeds. This page contains a single entry by Toni published on June 11, 2013 3:00 PM. GMOs and Health: The Scientific Basis for Serious Concern and Immediate Action was the previous entry in this blog. Attorney Refutes Dr. Offit's Vaccine Exemption Criticism is the next entry in this blog.